The yearly rate of growth of the personal consumption expenditure (PCE) price index adjusted for food and energy stood at 1.3 percent in June — the same figure as in May. 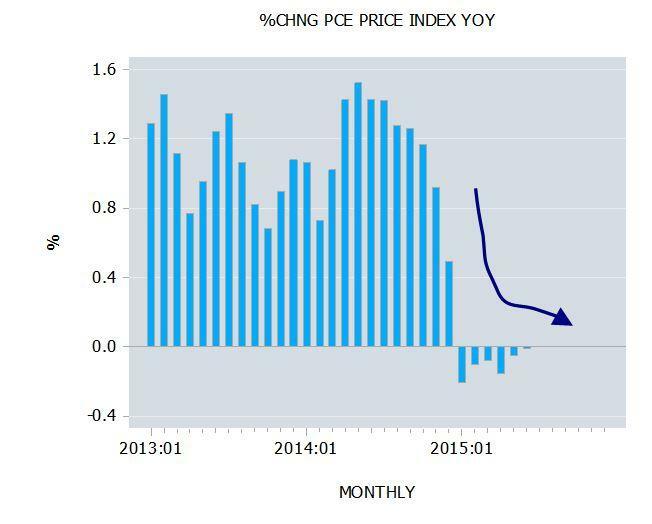 Note that on average since the beginning of this year the yearly rate of growth stood at 1.3 percent. Many economists have expressed satisfaction that the yearly rate of growth has been stable so far notwithstanding that it stood below the Fed’s target of 2 percent. Meanwhile, the yearly rate of growth of the overall personal consumption expenditure price deflator stood at minus 0.01 percent in June, versus minus 0.1 percent in May, and 1.4 percent in June last year. 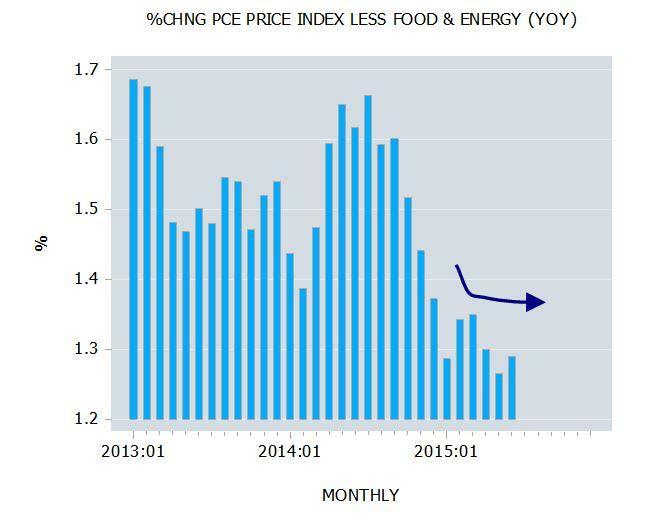 Stability in the yearly rate of growth of the PCE less food and energy price deflator is regarded as a very important thing for most economists. It is held that a stable price level will make the movement in the relative prices of goods and services more visible, thereby allowing a more efficient allocation of resources. There is the danger that focusing on so-called price stability may cause economists to overlook the underlying factor that is likely to set in motion an economic bust. 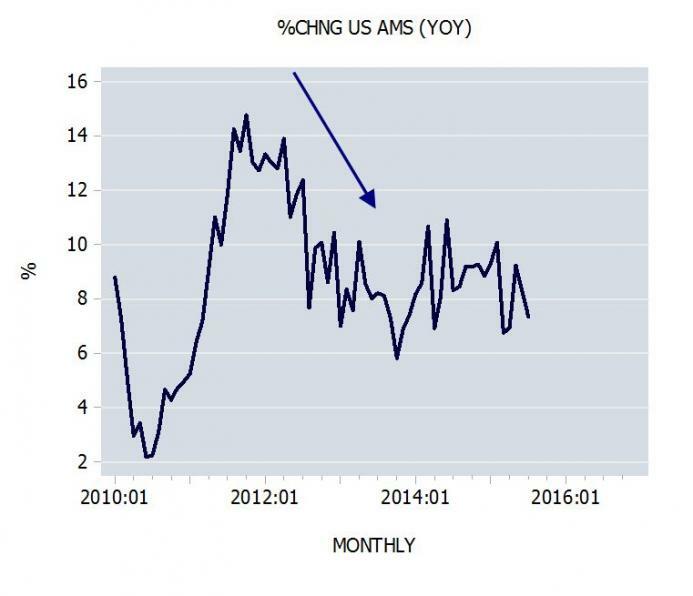 However, this underlying factor may be the decline in the growth momentum of the money supply during October 2011 to October 2013. Note that during 1927 to the end of 1928, the US consumer price index was displaying relative stability (see first chart below). 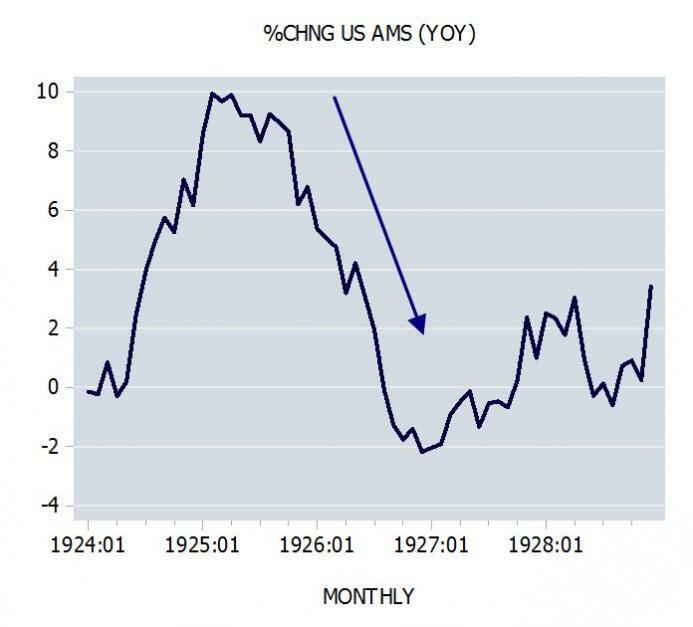 This caused many commentators to suggest that the US economy had reached a state of economic stability and to ignore the fact that the growth momentum of the money supply fell sharply during February 1925 to June 1927. This sharp decline set in motion an economic bust of the stock market in October 1929 and the following collapse of economic activity. One of the reasons that most economists of the 1920’s did not recognize the existence of an inflationary problem was the widespread adoption of a stable price level as the goal and criterion for monetary policy. 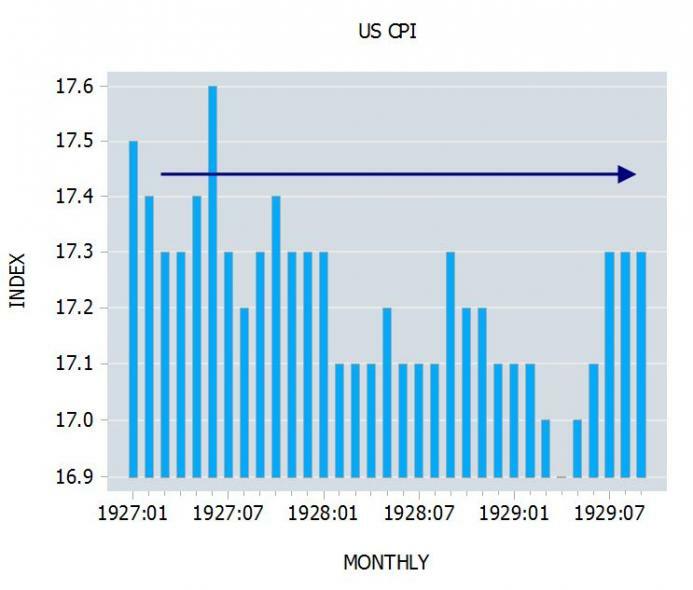 … The fact that general prices were more or less stable during the 1920’s told most economists that there was no inflationary threat, and therefore the events of the great depression caught them completely unaware. 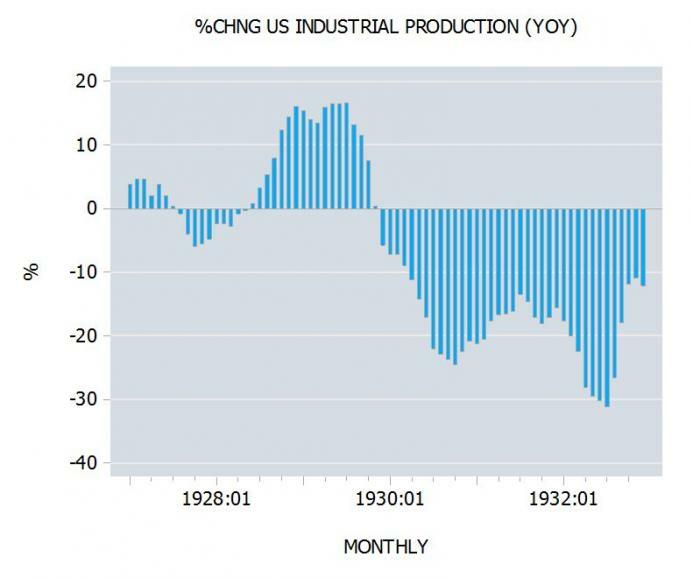 Observe that the yearly rate of growth of industrial production climbed from 4.6 percent in February 1927 to 16.6 percent by July 1929, before plunging to minus 31 percent by July 1932. It is likely that the severity of a bust is dictated by the state of the pool of real wealth, namely, whether or not there are still a sufficient number of wealth generators to support various bubble activities that have emerged on the back of the loose monetary policy of the Fed. © 2015 Copyright Frank Shostak - All Rights Reserved Disclaimer: The above is a matter of opinion provided for general information purposes only and is not intended as investment advice. Information and analysis above are derived from sources and utilising methods believed to be reliable, but we cannot accept responsibility for any losses you may incur as a result of this analysis. Individuals should consult with their personal financial advisors.